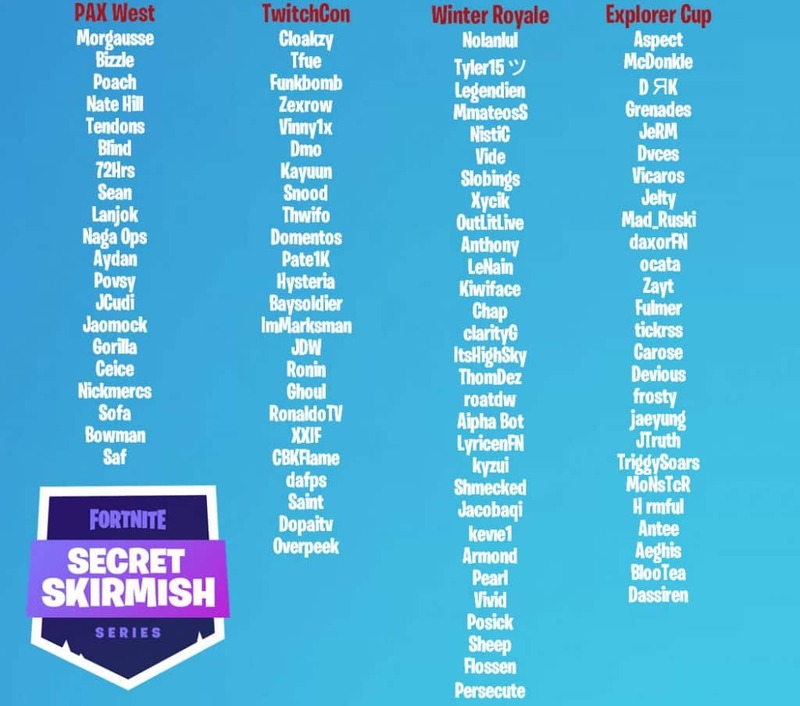 Here are the players with the best chance to win Fortnite’s $400,000 Secret Skirmish solo event, based on a range of different elements. In January, Epic announces it’s first major tournament of 2019, the Secret Skirmish. 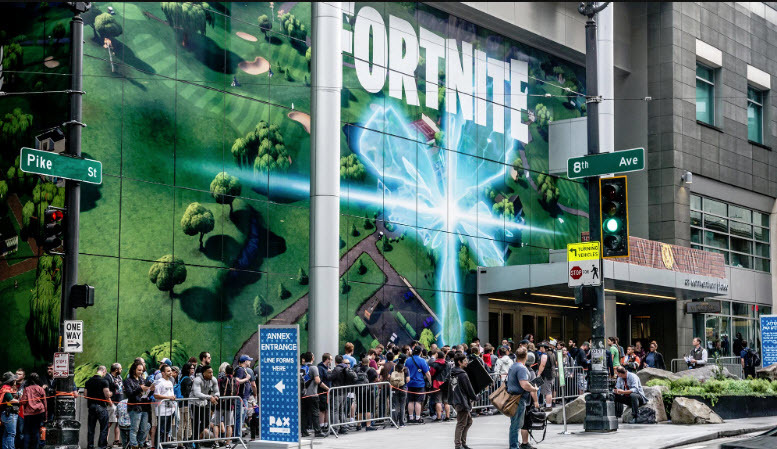 Set for February 14-15, Epic deemed the tournament its first major step towards its highly anticipated Fortnite World Cup. Although the formats, rosters and the location have been provided, Epic has not provided much more detail. 100 NA top finalists from, Pax West, TwitchCon, Winter Royale and Explorer Cup were selected and are now in Los Angeles preparing for Fortnite’s 3rd major offline tournament. Here is a detailed look how each player qualified. One of the most important factors to consider, when looking at players who stand the best chance at winning, is how they qualified. Some of the players above have played in multiple events. Pax West and TwitchCon were offline events, while Winter Royale and Explorer Cup were decided online. Although a skilled player can overcome adversity at any time, having some offline experience is a key element for the Secret Skirmish. More then half of the players have never been placed at center stage, outside of their comfort zones. Fortnite competitive is still very new when compared to other competitive titles. Players are not used to the travel while playing outside of their comfort elements. This takes time to adjust and many of the players from Winter Royale and Explorer Cup will need to get comfortable playing in front of others right away. With only 6 games to rack up points, there is no time for error. There is no doubt, that for any Fortnite Solo event, luck plays a huge role. A player can’t predict zones and how much rotation they will need. A pattern that most players use, is dropping the same area for every game. Solos are very different from duos because a player needs to rely on himself for farming and rotation. There are two ways to go about it. Aggressive playing styles, like Aydan who drops Tilted in hopes of making out alive with at least 3 kills to lock in a point. Or 72hrs, who is more of a stealth approach waiting to pick off players during late game rotations. Playing styles will be the deciding factor on who wins the Secret Skirmish. Players need to adjust their styles and drop locations earlier rather then wait too long. 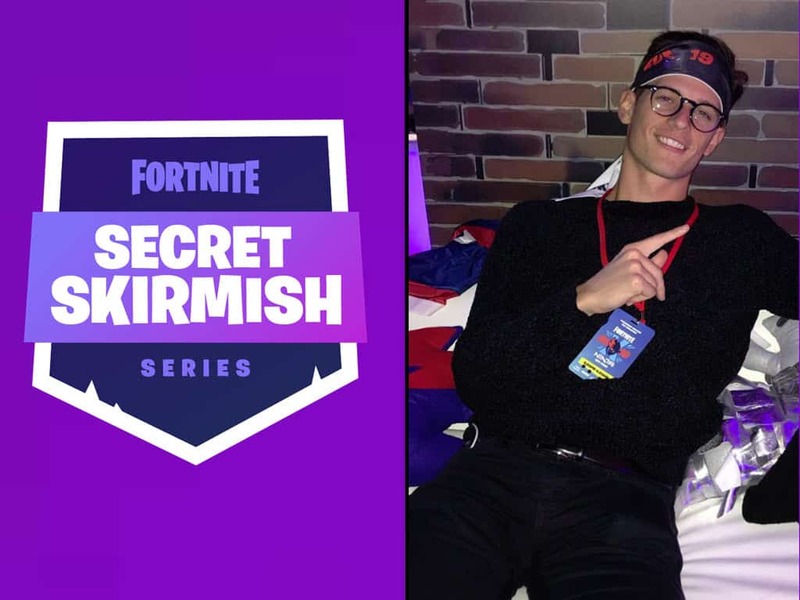 The Secret Skirmish is the perfect event for the former Ovt player. His major experience comes all in Solo appearances. He has both offline and online experience, placing 9th at Pax West for solo’s while also making it into the Winter Royale finals. Lanjok’s experience in solo tournaments makes him a dangerous player, so don’t be surprised to see him push top 10. Vinny’s big break happened when he teamed up with, then FA ZexRow, to finish 3rd at Fall Skirmish TwitchCon. He then followed it up in December by making to the Winter Royale finals. Vinny1x is a player who has continued to improve his game. 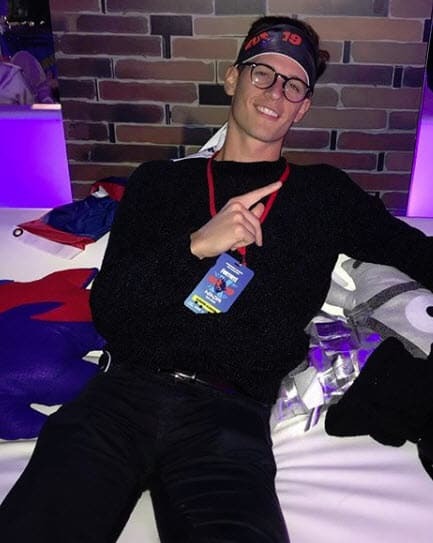 His offline experience at TwitchCon should also help him at the Secret Skirmish. Keep an eye on Vinny1x this weekend. One of the biggest stories of the 2018 Fortnite tournament series, was definitely the fall damage glitch that cost 72hrs the Winter Royale crown. 72hrs is battle tested from A-Z, making appearance in all major events. He finished inside the top 10 three times in 2018 Fortnite solo events. His experience is his greatest asset and there is no doubt he is looking for redemption for his 2nd place finish at the Winter Royale. The FaZe clan member can probably be paired with any Fortnite pro and be a threat to win a duo event. However, Nate Hill is just as good when it comes to solo series. He finished an impressive 4th at PAX West, then followed it up with 6th place finish, a month later during week 4 of the Fall Skirmish series. Nate Hill’s consistency is what makes him dangerous for the Secret Skirmish. With 6 games to play, Nate Hill can accumulate enough combined points overall to win the Secret Skirmish. If there is one player who you can be assured will “SHOW UP”, its Bizzle. His track record is deep, hardly ever placing outside of the top 10 in either solo or duo events. Some Fortnite players are meant to stream while others are meant to compete. 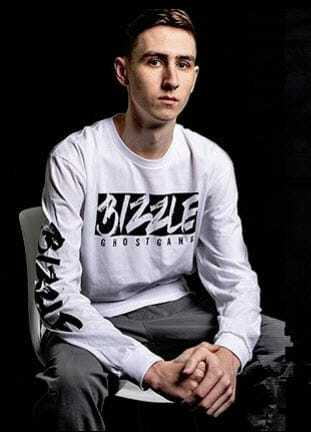 Bizzle is the player who will throw it all on the line as second place is the first loser. Placing in top10 is going to be automatic and the only thing that Bizzle has yet to accomplish is to win a major Fortnite series event. His strength is high ground, if he has it later game, he is very hard to beat. The Secret Skirmish could very signal his first time as a champ. The most dangerous Fortnite player on the planet makes his return, coming off his duo win with KittyPlays at the Korea Open in December. 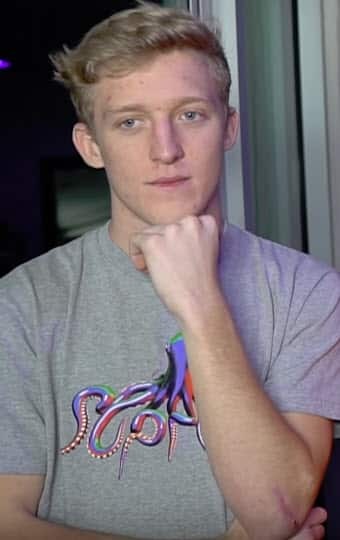 Rotations and inventory is the only thing that can keep Tfue from winning the Secret Skirmish. The thing about Tfue is that no player wants to challenge him off a drop. Because of this, he can pick his usual drop spots, like Paradise or Frosty and farm up with no challenging. Off topic for a moment, It has yet to be seen if the new patch is affecting plane droprates and locations. This has to be mentioned because of how Tfue likes to drop Frosty Flights. If there is a possibility of missing planes at Frosty, Tfue might rethink his strategy. If Tfue can get some close kills late game to keep his mat count healthy, he will be very hard to stop. Tfue is the only player who can literately run away with the tournament. Although all players invited are extremely talented, it’s impossible to cover all of them. From Winter Royale Winner Nolan, to fan favorite Zayt, everyone can win this event with a little luck. It will be interesting to see how the Pop Cup players fair out against the veterans who are accustom to offline play. The Secret Skirmish Solo Event starts Friday February 15th at 1pm PST, and can be viewed live on Twitch.